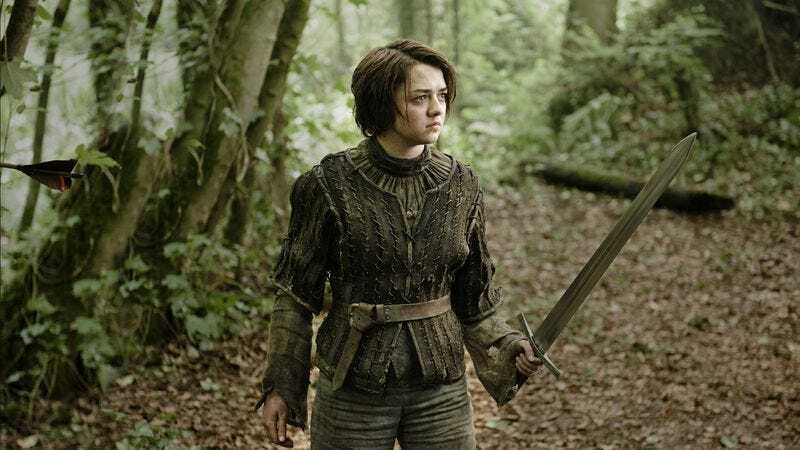 We may never get a Game Of Thrones/The Walking Dead mashup (and with good reason), but we’ll soon see Arya Stark battling hordes of zombies. Variety reports Maisie Williams is in talks to star in The Forest Of Hands And Teeth, a film about a world overrun by zombies following a virus outbreak (we know, we’ve heard that one before, too). Williams will play a character who, not content to stay within the confines of a safe zone, sets off for the ocean. Somehow, the survival of the human race will ultimately hinge upon her leading a “ragtag group” of survivors (is there any other kind?) through a zombie-ridden forest. Kate Maberly is writing and directing the film, which is an adaptation of the eponymous bestseller. This is Maberly’s first feature-length film; she previously wrote and directed the short Charlie’s Supersonic Glider. The Forest Of Hands And Teeth is the first book in a post-apocalyptic trilogy, so if the film’s successful, Maberly and Williams might set off on their own YA franchise. So let’s all hope Williams remains busy with Game Of Thrones, or recurs on Doctor Who or something.